Japan Impact is a cultural non-profit event that aims to present Japan to French-speaking Switzerland. The events will happen on February 17 and 18 in Lausanne. So, see you in Switzerland next week? 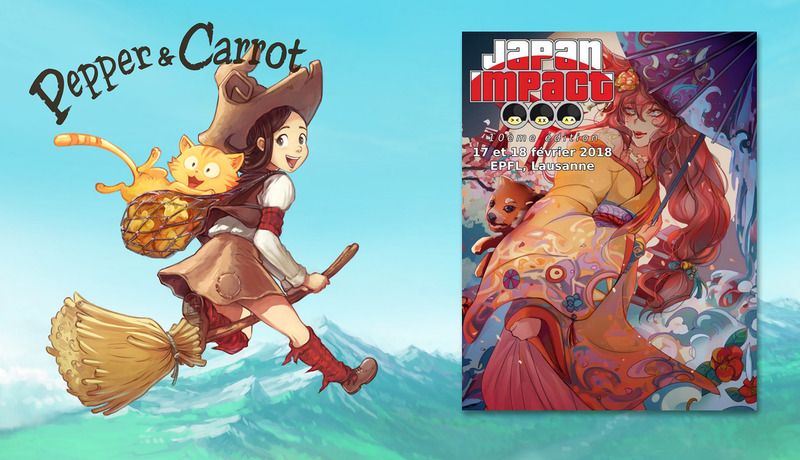 All information, schedule, tickets are on https://japan-impact.ch. You're getting closer to your Japan goal :) Have a good trip! The trip to India was an adventure! I wanted to do a blog post on the topic, but I was waiting for the event to release the video of the talk first. My best souvenir was to meet in real life my friend Raghukamath , an artist using Krita and very active on beta-testing and development. I know him since 2014 online. It was also a good time meeting Francesco of Blender Institute and Timothée from Krita dev and Gcompris. I also met and get a lot of good talk with other guests. I'll poke the team of this event, maybe they released the video somewhere ; I remember the stage was in front of so many camera. Japan-Impact was a very good week-end. The trip to Switzerland was fine, good food, good hotel and funny convention with interesting guests. Only a minor detail: I felt old, the place was filled and organized by students, and I was like the 36 y/o guy within the crowd ; the old one. But exept that, I also had good time doing the signing sessions and giving the two lectures. Yes, it was evident in the Inkscape devs, too, what a difference it makes to actually meet the people one works with on a project. (if you want to meet up with some of them, LGM in Spain will be an opportunity to do so, see http://wiki.inkscape.org/wiki/index.php/Hackfest2018_LGM). :-o I'm even older... lol - but at least I have first-hand experience of watching Heidi and Tao Tao as a child... (Germany, though, not France).